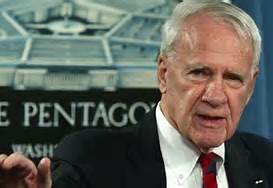 Today the Foundation and the extended Jackson family mourn the loss of a giant and a man central to the Jackson tradition: we mark the passing of former Secretary of Defense Dr. James Schlesinger at the age of 85. Dr. Schlesinger was Director of the CIA under President Nixon as well as becoming the first Secretary of Energy under President Jimmy Carter. He was also a recipient of many awards, including the National Security Medal and the Dwight Eisenhower Distinguished Service Medal, and was awarded nine honorary doctorates. His career achievements as a public servant are too numerous to mention. Jim Schlesinger was a man distinguished by his intellectual rigor and the breadth of his knowledge. He was a founding member of the Board of Governors of the Henry M. Jackson Foundation and played a key role in the establishment of the Foundation. Once when he was in Seattle in 1994 to give the Henry M. Jackson Memorial Lecture, he presented his prepared remarks for an hour on America’s foreign policy and what he viewed as a widespread sense of drift in the uncharted waters of the post-Cold War world. What struck many of those in the audience, however, was his mastery of the hour that followed his lecture: the question and answer period, which ranged from the expansion of NATO, the North Korean nuclear threat and the post-Deng era in China to the role of the CIA in the post-Cold War world, nonproliferation treaties and whether the U.S. should be providing Russia with financial aid. His complete command of every subject raised was breathtaking and a true expression of the variety and depth of his important political posts he held throughout his career. Jim Schlesinger remained an engaged and active observer and analyst of political and military affairs until the end. He was regularly consulted for his trenchant analysis, scholarly depth and quick mind. His role in America’s public life will not be easily filled. We will miss him.